Happy Holidays everyone! We had a great Christmas here with Avery. That girl sure knows how to get you in the Christmas spirit. 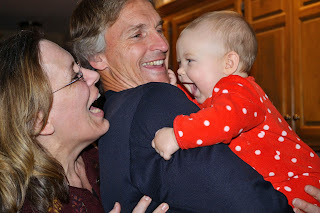 Now although she's too young to understand or even care for things like presents, Santa, or other holiday traditions, it didn't stop us from having some Christmas fun with her. Also, Christmas turned out to be the marker for many milestones for her as you'll see later in the post. Now before Christmas came, I got an itch to do some decorating. We have always decorated in the past with a tree in the living room, garland on the stairs, and stockings on the mantle, but this year I felt like turning it up a notch. It reminded me of the nesting instinct I got when I was pregnant with Avery, only this time I didn't want to clean and organize (okay well I still did), but what I really wanted to do was fill the house with fun Christmas decor. Why? I have no idea. Maybe it's my love of Pinterest or the fact that Avery's here now so I want some stuff for her to look at (as if she cares at this age). Either way, this "holiday nesting instinct" had me hitting the stores in search of some festive decor for our house. Cute and funky Christmas trees from Pier 1.
some more with this "green" snowman! Thanks Chris, you know me well! Christmas tree decor is one of my favorites! good "advent" ideas for next year? Love ornaments from The Office. One of many skater-style ornaments for you know who. is the one from our first Christmas together back in 2003! Avery even got in on the decorating spirit as I had her make a "hand print reindeer frame". A craft that I had my students at school make for their parents. Usually finger painting with 3-5 year olds isn't exactly my favorite activity, but I think I would take doing that over painting with an 8 month old any day! Things got a bit messy, but it was worth it as I'm sure we'll have fun looking back on how tiny (and pudgy) her little fingers were on her first Christmas. I attempted to stamp her hand, but she wouldn't open her fingers! afterwards, so I walked away for a second and this happened! The finished product that hangs on our fridge. Once Christmas finally rolled around we were all in the mood for some holiday gatherings with our family and friends, here are some pictures of the fun we had starting with Christmas Eve. By the Disney Christmas tree. Playing with a pop-up toy she got. Later that afternoon while I was cooking up a storm to get ready for our holiday dinners, Avery did one of her first milestones of the holiday season: drinking from a straw! Hooray! Ever since I started baby-led solids two months ago, I've been giving her drinks of water from a small shot glass, and while it worked for the time being, it was pretty messy and all she wanted to do was control the glass and play in the water. Enter Lollacup Infant and Toddler Straw Cup...my savior! I found out about this cup online ($18) and I couldn't wait to try it with Avery. But when it finally arrived, I gave it to her and all she did was chew on the straw. Can you tell she likes this cup?! Darn it. I knew she was capable of drinking from a straw since she had taken a few sips from my green smoothies when I used my glass straw, but for some reason it wasn't clicking with her. Hello, new mama, maybe she needs to get used to it first. So I took a step back and just let her explore it, hold it, and play with it. Every now and then I would step in and tilt it up for her so a little water would come down, then she'd go back to playing with it. But on Christmas Eve, I looked over and there she was drinking from the straw! Woo hoo! She got it. Ever since then, she gets very excited when I bring the cup out at meals and I've even tried putting some smoothies in the cup for her to drink. So there you have it, Avery can drink from a straw, no more shot glass of water. I can drink all by myself. Later that night we spent some time with my family. Here we are at dinner where Avery got to use my grandmother's highchair! Talk about going green with this family heirloom. Love it. "Put your hands up...it's Christmas time!" Her shirt came off for this meal. It was just a bit too messy! Then it was time to open some presents. we would say, "Yeah!" and she would start clapping. Then it was time to go to sleep so that "Santa" could come. Not to worry...the smiles came out after a quick nursing session. "Okay wait, I like Christmas!" (tights here, tutu here) from Grandma Cheryl. Notice anything different about the presents under my tree? Well they're all wrapped in fabric, not wrapping paper. This is the first Christmas that I didn't use any wrapping paper for any of my gifts. Instead I did two things: used some drawstring fabric bags that I got off of Etsy, that were very nice and ready to go. It was about $22 for four bags in varying sizes. And I also used holiday fabric that I got from JoAnn Fabrics and just cut to various sizes to wrap around the gifts (just like I did back when it was Brandon's birthday in this post). My cloth-wrapped presents under the Christmas tree. The cloth wrapping worked out great for the most part, the only downside was that Avery couldn't "rip and tear" like she loved to do when opening other presents. We basically pulled things out of the bags for her...a little anticlimactic. So where as the cloth wrap is perfect for adults, it wasn't so fun for kids. Perhaps next year I'll do a bit of both. Does your family do any type of green wrapping for Christmas presents? Share below. I also tried going green with my gift tags this year by using these cool recycled chalkboard tags also from Etsy. I got a set of 10 for $5. They are such a unique idea and I had fun using them, but the only downside is that the names come off fairly easy...obviously, since it's chalk. I think the problem might be that they're tied to cloth bags, as opposed to boxes, and as a result they move around a lot more...thus equaling more chances for smudging. But still, they were a fun alternative to traditional gift tags. Chalkboard gift tag from Etsy. Here she is mesmerized by the tissue paper. "This pretend fridge is amazing!" excited when my parents got Avery these adorable pig pajamas! Reading a new book with Grandma Karen. Playing catch with Uncle Austin. Tights and a tutu won't hold this girl back. Grandma Karen and Grandpa Frank. but it's still fun to see! Over the holidays, somehow Brandon and I got to go out alone! Shocker! We went out to dinner at Genghis Khan Mongolian BBQ with his family (minus all the nieces and nephews)and we had a great time and ate lots of great food. Avery was in good hands as my family, her grandparents were the babysitter. A night out on the town...at Genghis Khan. Brandon's plate...lots of veggies, noodles, and tofu. seasoned with some chipotle powder. "I made it to the landing." Another funny thing she likes to do with the stairs is to carry a "buddy toy" as I call it. She'll just pick any toy and hold on to it the entire way up to the top of the stairs. It's pretty funny. a ball-like toy that was a gift from Uncle Andrew. the energy from the sun" a quote from one of my yoga DVDs. and then climb to it. Whoa! I climbed really high up! ﻿Now as if I haven't shown you enough pictures, here's one last one for you of the 5th milestone of the holidays: a new front tooth. Now it's just cut through the gums, so it's pretty tiny, but this might explain why she's been so congested and had a runny nose for the past few days. From some things I've read online it seems that there might be a connection between teething and mild cold-like symptoms...especially a runny nose. Anyone else notice this when you're kiddos were teething? See that front tooth to the left just poking through? I wonder when the next front tooth will poke through? Well that wraps up our holidays here at this "green house". I hope you had a good one as well. Coming up soon is a new recipe for one of my favorite, cruelty-free recipes to take to holiday gatherings. Your wreath turned out great!! Your first Christmas with Avery looked wonderful! So great to see all those new milestones too :) Loved reading these new posts!